The unabated emission of Carbon dioxide by burning fossil fuels by human beings is altering the chemistry of our oceans at an unprecedented rate in the last 65 million years. When excess Carbon dioxide is absorbed by seawater it forms Carbonic acid, which is weak and unstable and increase the Hydrogen ion concentration in seawater. It decreases the pH value. The seawater is alkaline and the mean ocean surface pH was measured at 8.2 in 1750.This acidity has increased by 30% in recent times due to absorption of vast amount of man-made carbon dioxide since pre-industrial time. The amount estimated are about 500 Giga tones or 25% emitted into the atmosphere. According to UN report: “If we continue at this rate the ocean pH will decline by a further 0.3 by the end of this century, an unprecedented 150% increase in ocean acidity. This rate of change has not been experienced for around 65 million years, since the dinosaurs became extinct. Such a major change in basic ocean chemistry is likely to have substantial implications for ocean life in the future, especially organisms that require calcium carbonate to build shells or skeletons. Not all organisms will react at the same rate or in the same way to decreasing carbonate ion concentration. There are three naturally occurring forms of calcium carbonate used by marine organisms to build shells, plates or skeletons: calcite, aragonite and high magnesium calcite. For example, microscopic plants called coccolithophores surround themselves with protective calcite plates; aragonite is used by periods to build their shells and corals use it to make their skeletons that help to form reefs; while some echinoderms – starfish, sea urchins, brittle stars - utilize magnesium calcite to form their exoskeletons. Magnesium calcite is more soluble and sensitive to ocean acidification than aragonite; with calcite being the least soluble of the three. A lowering of pH and reduction of carbonate ions will make it more difficult for organisms to sustain their calcified shells, and in under saturated conditions, waters become corrosive to these minerals. Additionally, most multicellular marine organisms have evolved a regulatory system to maintain the hydrogen ion balance of their internal fluids14 and spend energy doing this so an increase in hydrogen ions in seawater means that they will have to divert more energy away from important processes such as growth and reproduction to do this. However, studies of mussels, crab and sea urchin species have shown they have only a partial or no, compensation mechanism15 potentially making them more vulnerable than those organisms that possess a compensation mechanism”. 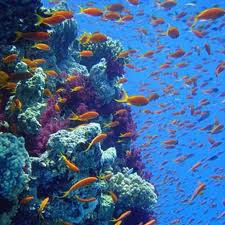 (Ref:UNEO) The contribution of marine food in the form of Protein to food security is substantial. 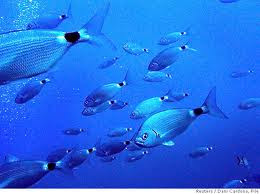 Fish supplies about 15% of animal protein for about 3 billion people worldwide. Further one billion people depend on fisheries for their primary source of Protein. Steadily increasing population is pushing the demand for protein even further, while the fish stock is dwindling in many parts of the world due to over fishing and environmental degradation. “Productivity ‘hotspots’ such as upwelling regions where cold water is rich in both nutrients and CO2, coastal seas, fronts, estuaries and sub-polar regions often supply the main protein source for coastal communities. However, many of these areas are also projected to be very vulnerable to ocean acidification this century.” (Source: UNEP) Global warming has a much wider ramification than originally thought. It is not just warming the globe but threatens the food security and our own survival as human beings. you're struggling with a bad credit score history and you also don't have source of money. record and monthly income while using requirements of lenders. Why Carbon is inevitable to achieve Zero Carbon emissions? Can alternative energy combat global warming? Can Bio-gasification transform our world? Coal-water-slurry- a new source of Hydrogen? Theme images by sebastian-julian. Powered by Blogger.